Brighton, Iowa Pole Barn Buildings Designed by Greiner Buildings. We build commercial and residential pole and post frame buildings for Brighton, IA. Situated in Washington County, Iowa; we are happy to design and construct your dream metal pole barn Machine Shed, Lined and Insulated Shop, Garage, SHOME®, Man Cave, Livestock facility or Commercial Building. 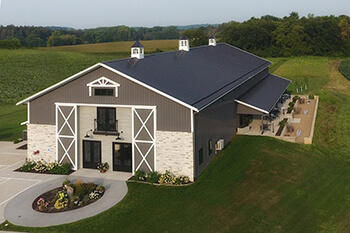 Agriculture Buildings and Cold Storage: No matter what shape or size you need, Greiner Buildings can construct an attractive and durable agricultural building or cold storage unit for you. Mini Storage: Mini storage is an incredibly important asset to any business. Our team will help you choose a design that works best for you, and construct according to your custom preferences. Our mini storage units are made to be easily accessible while requiring low maintenance. Cattle Sheds: At Greiner Buildings, we know how important your cattle is to your livelihood. That is why we strive to construct the perfect animal sheds that meet all of their needs. We install slanted roofs for good insulation, as well as proper ventilation. Ensure your cattle with maximum comfort and security with a cattle shed from Greiner Buildings. Horse Barns: If you are in need of a riding area, stall barn, or custom stable, you have found the right place! For all of your equestrian needs, Greiner Buildings is glad to help. We can professionally insulate your horse barn and install haylofts too. Commercial: For your Brighton commercial or public service building, Greiner Buildings offers 2D and 3DCAD Design, as well as various stylish and inexpensive design options. Our commercial buildings fall into code and are custom-designed to improve your growing or established business. Insulated Shops: In order to keep your tools and equipment safe and dry, Greiner Buildings provides professional insulation installment services. We also design custom hobby shops for your home or business. Residential Homes: Greiner Buildings is proud to build custom pole buildings for residents of Oskaloosa, IA. Our custom homes are affordable, energy efficient, and made with fantastic quality. For all of your post frame and pole building needs in Brighton, IA, be sure to call Greiner Buildings today. We are your design, construction, and repair specialists in Iowa. We look forward to working with you!